Big data is big in business, but when does too much analysis lead to paralysis and not progress? Jennifer Bridges, PMP, shows you the red flags that appear at the onset of analysis paralysis. Jennifer shared the buzzword of the day, “data,” especially the term “big data.” It’s an obsession for many companies who feel they can mine that information to better serve their customers. But what is big data? It’s any large amount of information, such as financial data, health records, buying trends, etc. It can be gathered electronically with dashboards or reports, or the old-fashioned way with paper records, reports, spreadsheets, graphs, etc. The process is simple: collect data, analyze data, make decisions and then act based on those decisions. But there can be a bottleneck between the collection and analyzing stages, where the desire to get more data and further analyze it can lead to something called analysis paralysis. Another way to think of analysis paralysis is that it’s when one starts to over-analyze or over-think a situation, which leads to inaction. That is the opposite result you want from the process. You want to make decisions and act. But analysis paralysis leaves you trapped in a loop of never stopping the collection and analysis of data. That defeats the whole purpose of big data, which is a tool to an end and not an end in itself. How can you tell that your starting to get bogged down and in danger of becoming paralyzed in the analyzing stage of your data collection? If you find yourself exhibiting one or more of these telltale signs, Jennifer suggests doing the following. Jennifer offered some examples as to why people fall into this trap. While it might seem like you’re being cautious, it can actually have a seriously negative impact on your project or business. If you can’t get past analysis paralysis, it can lead to any number of issues, large and small. Jennifer listed only a few. Pro-Tip: Another way to look at analysis paralysis is an inability to pull the trigger on making a decision. If you’re looking for ways to improve your decision making try arguing it out with colleagues, getting perspective from peers and experts or using precedent to learn from experience. Take it Further: Once you’re certain that you’re analyzing data efficiently, try using gap analysis to check on the status of your projects. 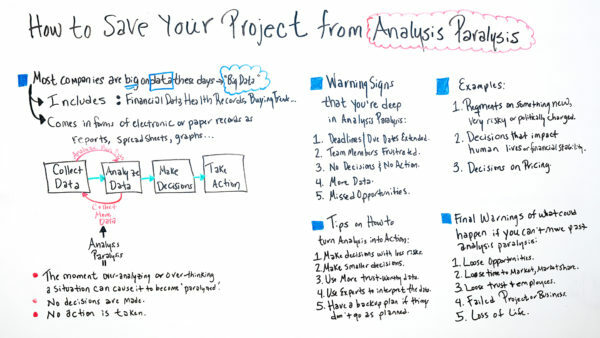 Today we’re talking about how to save your project from analysis paralysis. Well, these days, most companies are big on data. As a matter of fact, people are excited to be on big data projects. Well, what are we talking about? Well, it’s data that includes information about financial data, maybe health records, buying trends, and it comes in the form of electronic or maybe even paper records. Comes also in reports, spreadsheets or other kind of graphical information. Well, the companies collect this data in different means and they take it and they analyze it. Maybe they use computer or electronic computations, or maybe they even have maybe people or staff of people analyzing the data and they take it and they make important decisions about the company, or projects, and they use it to take action. Well, what happens is analysis paralysis happens when they continue to collect more data and then analyze it some more, and then they collect more data and they just keep in this loop. So it’s the moment of time where overanalyzing or overthinking a situation can cause it to become paralyzed. So no decisions get made and no action is taken. So let’s look at some warning signs to see if you’re deep in analysis paralysis. Well, some of the clues and some of the warning signs are maybe your deadlines or due dates get extended because the action can’t be taken. Team members tend to get very frustrated because they’re hanging on or maybe they have to go back and change or requote work. No decisions and no action gets taken. And again, more data, more data. We got to get more data. And then what happens is the biggest warning sign is missed opportunities. Well, here are some tips on how to turn analysis into action. Well, first of all, make decisions with less risk, okay? So if you narrow those down and begin to make smaller decisions, you keep making progress. Similarly, make smaller decisions where it doesn’t have to be the whole encompassing decision that totally impacts the projects, but smaller decisions keep making progress. Use more trustworthy data. Sometimes people don’t have trust in the data that they collect, so they continue to get more. But by using more trustworthy data, you have more confidence in making that decision. Use expert to interpret the data. Sometimes if you’re getting data on new projects or new things you’re not familiar with, it’s hard to determine which way to go with it. But if you use an expert, they typically know how to interpret the data. And then also have a backup plan. You know, sometimes we make decisions and it ends up being a bad decision or maybe it takes us on the path or the route we don’t want to go so we have to back up and make a new decision, but that’s okay. So here’s some examples of why people tend to get in analysis or paralysis or certain situations. Could be on requirements, trying to spec requirements or quotes on something new, something you’ve never done before. Something that may be very risky or even politically charged. Could be that the decisions impact human lives or even the financial stability of a company or a market. So another example is decisions on pricing. Pricing is very important for most companies and projects, how to price something. So some of the final warnings of what can happen if you can’t move past the analysis paralysis, again, ultimately it could lead to a loss of opportunities. It could be of loss to time to market. Sometimes in certain industries, if you can’t get to market in time, you could lose those opportunities and even market share. You could also lose the trust of maybe your shareholders, maybe even some of your employees. And you can ultimately lead to a failed project or even a failed business. And, some situations could lead to the loss of life. So it can be very important to make those decisions and take action. So if you need additional information or resources or even a tool to help you prevent analysis paralysis, then sign up for our software now at ProjectManager.com.